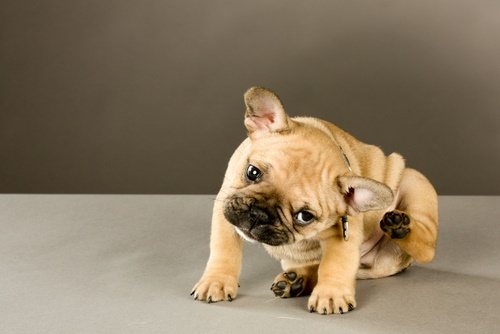 There are several advantages to using flea pills over flea spray for your canine friends. You don’t have to deal with any unpleasant smells or stains this way, and it is often safer for your dog and other pets you may have. Sprays can wash off your dog or otherwise be rendered ineffective, and that can mean wasted effort and product. PetCareRX.com also recommends using pills for pesticide-sensitive pets. In order for you to make an informed decision about which flea pills to use with your dog, we have researched a few different options for oral flea medication. This way you can treat your pooch with confidence that it is kept safe. Lack of effectiveness- Many oral medications are not as effective as their spray or topical counterparts. They often provide only partial protection for your dog’s body, whereas topical applications and sprays can easily cover the entire dog. Know your dog’s diet- Not every dog can take an oral supplement. Due to dietary problems or some other health issue, your dog may need to go with some other form of flea control. For safety purposes and the health of your dog, it is always best to consult your veterinarian before giving your dog any medication or treatment, even for something as common as fleas. 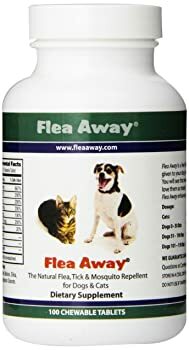 Mostly adult fleas will be affected- Oral treatment for fleas, according to AKC.org, is generally going to target adult fleas, so the larvae and eggs may not be destroyed by the treatment. Keep that in mind as you try to treat your dog. 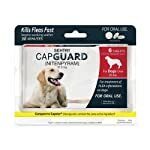 This makes for a very good preventative measure for dogs, to keep them from getting fleas, and it works well on an adult flea infestation, but eggs and larvae may not be affected. Potency will vary- Some oral medication for your dog will be far stronger than others, and you can’t always tell that according to price. Do some research and look at what those who have used the products have to say about them. Here are some of the best oral flea treatments on the market today. Bayer makes this same flea and tick oral treatment in different varieties for different-sized dogs. You want to be careful to feed your dog only the right oral treatment for its size. Feeding it a dose meant for a larger dog can result in health issues. 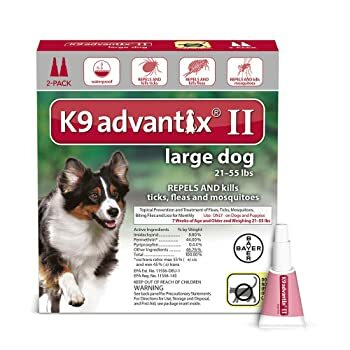 This one is potent enough to deal with fleas at all stages of life, which puts it way above a lot of similar products out there (remember that oral treatments usually aren’t effective in preventing all stages of the flea life cycle). While many others take about 30 minutes to work, this one works in as little as 10 minutes. So, you have a fast-acting, potent flea control treatment that contains no chemicals and that is safe for your dog. It’s no wonder this is one of the most recommended flea control treatments available. This one from Sentry takes a bit longer to work, and it is supposed to start killing fleas in about 30 minutes. It targets solely adult fleas, so you will have to deal with flea larvae and eggs on your own. With a flea guard like this, you will need to vacuum for fleas on a daily basis until they are gone. You’ll have to go after the eggs and larvae, and the Sentry Capguard pills will take care of the rest. They will also do a decent job of preventing another infestation in your dog. This is one of the gentler flea treatments out there. That means that it will not kill fleas very quickly, taking hours sometimes before it begins being effective. That also means it is very safe for your dog, and even safe enough for most cats. If you aren’t sure if it is safe for your pet, then you can always talk to your vet. You should also weigh your pet, just to be sure they are the right size for this treatment. It will be incredibly rare for your pet to have a bad reaction to this flea control pill, so it’s a good choice for sensitive pets. This is a good flea treatment to use if you want to handle more than just fleas. It will take care of ticks and mosquitos too, making it a great all-in-one pest control option. This special formulation is designed to work with both cats and dogs, and it is incredibly safe. It adheres to FDA standards and is easily digestible, minimizing the potential for stomach issues and other problems that many pets have with some oral flea medications. 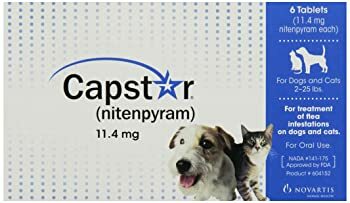 If your pet has had some issues with medication in the past, particularly flea medication, then this is probably the one you want to pick. Do be careful about giving our pet this pill, though, if they have sensitive skin. It is possible that they will have bad reaction to it and potentially lose some fur or experience some other skin condition. You can always consult with your veterinarian to get expert advice about what you want to give to your pet. 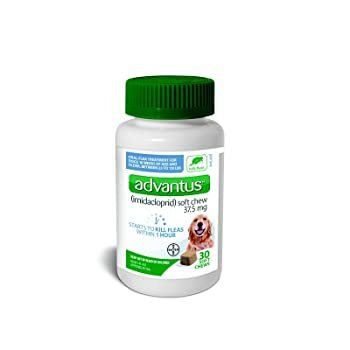 The Advantus flea pills will take about an hour to begin killing fleas, and you can give this treatment to your dog as often as one time per day. It’s suitable for any puppy that is over 10 weeks and four pounds. Anything less than that is not advisable and can be very dangerous, so weigh your dog before giving it this pill, if it is a small dog. You may not see results right away, but by six hours after you gave the dog the medication, you should see it at peak effectiveness, killing off pretty much all the fleas on your dog. You can continue to give the medication to your dog for a few days until there are no more fleas on its skin. This is not powerful enough to get rid of the larvae or the eggs in the area around your dog, so you will have to get rid of them on your own. This listing is comprehensive only based on surveys in the market and product reviews. It is always advised to consult a veterinary doctor before subjecting your pet to any medication. These tablets and medicines will surely get your and your pets spirit back up and lead you to a healthier and a joyful life ahead.